DUG Insight User ManualFrequently Asked QuestionsFrequently Asked Questions Volumes and DataWhy does the result of my Volume Combine process look different to my group of the same volumes? The group will use the settings of the individual volumes to adjust the displayed amplitudes. In a group, the volumes might have different amplitude ranges, but still display similarly. Volume combine doesn't "see" the display settings, only the actual trace values. 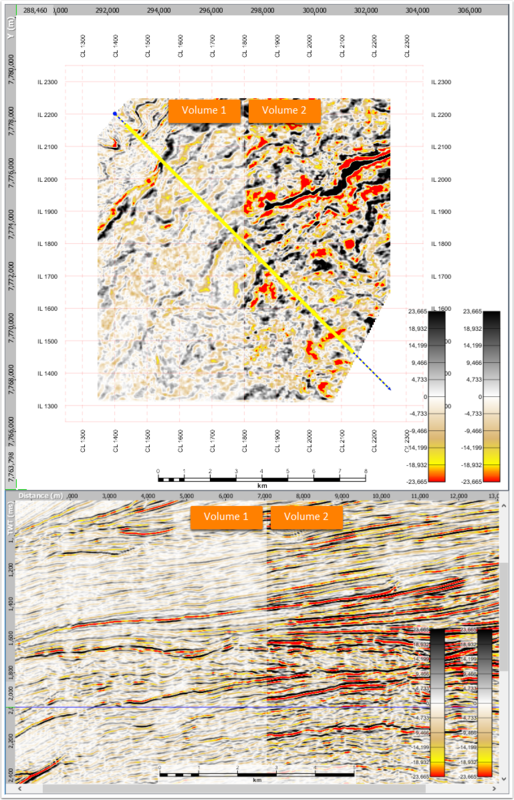 After combining, the resulting volume will contain the unchanged amplitudes from the original volumes. Use manual mistie correction to adjust the scale of the volume as it is read. 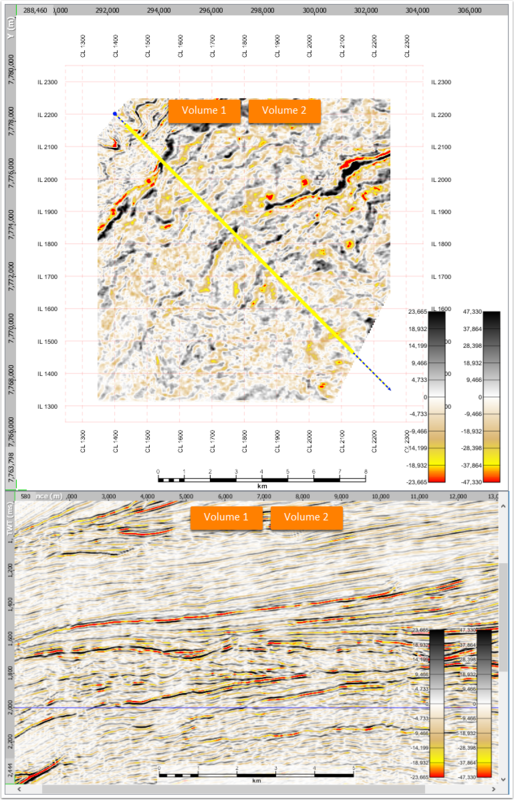 A timeslice view of both volume 1 and volume 2 grouped together. However, volume 2 has twice the amplitude range of volume 1, making the amplitudes display more intensity. Adjust the the Min/Max values for volume 2 to correlate with those in volume 1. The colourbar range for each volume is scaled to amplitude values (of one volume) so that amplitudes is shown with the same intensity across both volumes. Go to Process tab and add a Volume Maths (Simple) process. We will use Volume Maths (Simple) to rescale volume 2 to volume 1. Since volume 2 has twice the amplitude range of volume 1, dividing the values by two will properly scale volume 2. Still in the Process tab, add a Volume Combine process. Using the Volume Combine process, select volume 1 and the rescaled version of volume 2 (created from Volume Maths (Simple) process earlier) as the Input Volumes. This will create a new volume combining volume 1 and volume 2, with both having the same amplitude scaling. Manually adjust the amplitude scale. 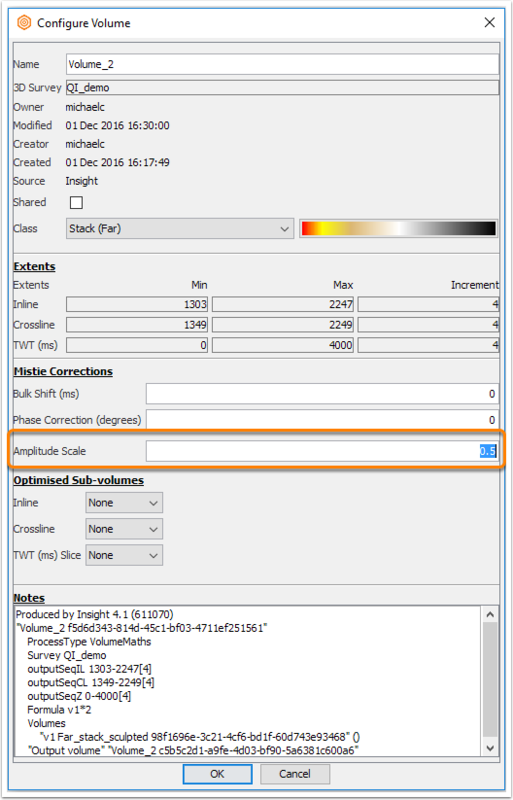 The amplitude scale can also be adjusted manually from the Configure Volume window. To scale the amplitude of Volume 2 to Volume 1, enter ‘0.5’ as the input for ‘Amplitude Scale’. Prev: How do I colour a volume differently between horizons? Next: What should I know about Insight's 16-bit data compression?